If you have not already used the Fusion forms tools to set up your form. Go over this tutorial that covers how to create a form using the Form tools. Select the form by clicking on the Form Label. This will select the Form Properties palette. 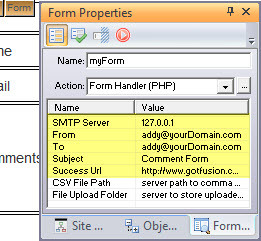 NetObjects Fusion will write a PHP forms processing script that will work with the form you created and use the settings you entered. Make sure your host supports PHP, upload the form and processing script and you should be all set.